Featuring the classic M7 pressure-gradient transducer with dual large diameter sputtered gold PVC diaphragms. The capsules are specially selected for optimum polar response. 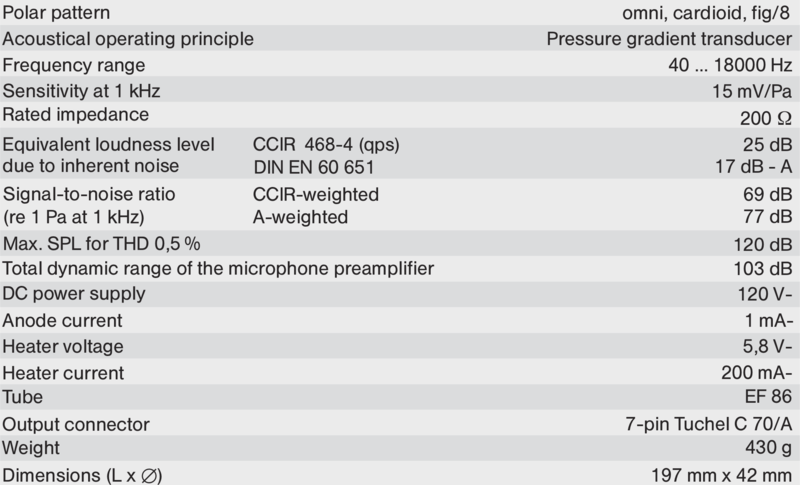 Direction of maximum sensitivity is perpendicular to the microphone’s axis, i.e.side addressed. A pattern selector switch, integrated with the power supply, selects from the three (omni, cardioid and figure 8) directional characteristics. This low noise valve (vacuum tube) microphone exhibits high sensitivity, a remarkable dynamic range, and has the typical full-bodied sound of valve microphones that are loved by vocalists and soloists. The valve preamplifier, selected for its sonic characteristics, is a well established design using a pentode working as a high µ triode. 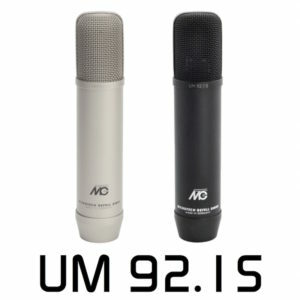 The UM92.1 S studio microphone features the classic Georg Neumann M7 capsule which is renowned for its sound quality. This pressure-gradient transducer uses two large diameter gold-plated PVC diaphragms. The capsules are selected for optimum polar response. Three directional characteristics (omni, cardioid and figure 8) can be selected with a pattern selector switch integrated into the power supply. This valve microphone has a remarkable signal-to-noise ratio and high sensitivity. The UM 92.1 S has the typical full-bodied sound of valve microphones that are preferred by vocalists and soloists. 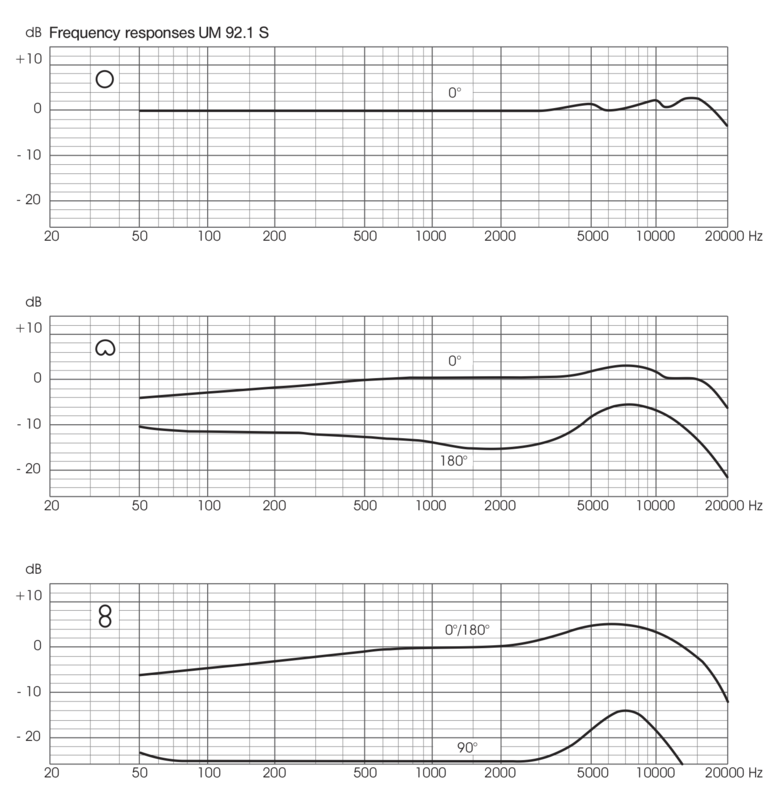 The direction of maximum sensitivity is perpendicular to the microphone’s axis (side addressed). The valve pre-amplifier is a well-established design equipped with a pentode working as high μ triode selected for its sonic characteristics. The UN 920.1 power supply provides the polarisation voltage for the capsule and the necessary DC voltages for the microphone’s preamplifier. For cable lengths over 50 meters it is recommended to have your service provider set the heater voltage of the power supply to 5.8 volts. The UN 920.1 can be powered from AC mains with a primary voltage of 115 or 230 volts / 50 or 60 Hz. The pattern selector switch and the on/off-switch are located on the front panel. The AC mains connector (with choice of voltage), the 7-pin Tuchel connector that powers the microphone and the standard 3-pin XLR connector for audio output are located on the rear panel.